Skin issues with our beloved pets can be relieved with the healing, soothing benefits of a plant you've probably viewed as nothing more than a weed. Plantain is a lowly "weed" we see in lawns and wayside places. One of those wild herbs we step on without a thought but should you suffer a bee or bug bite look for the fresh plant, wad a leaf into a poultice to get the juices flowing and apply to the bite. Take note how quickly the pain of the sting is neutralized. Plantain (Plantago major) is one of the world’s most common herbs. Also known as the “Mother of Herbs,” it is one of the top three common medicinal herbs along with dandelion and chicory. Most plantain plants have leaves with veins that fork outward from a central midrib. Plantain does not have a blossom, it only has a compact seed head that shoots upward and turns from green to brown as the seeds mature. 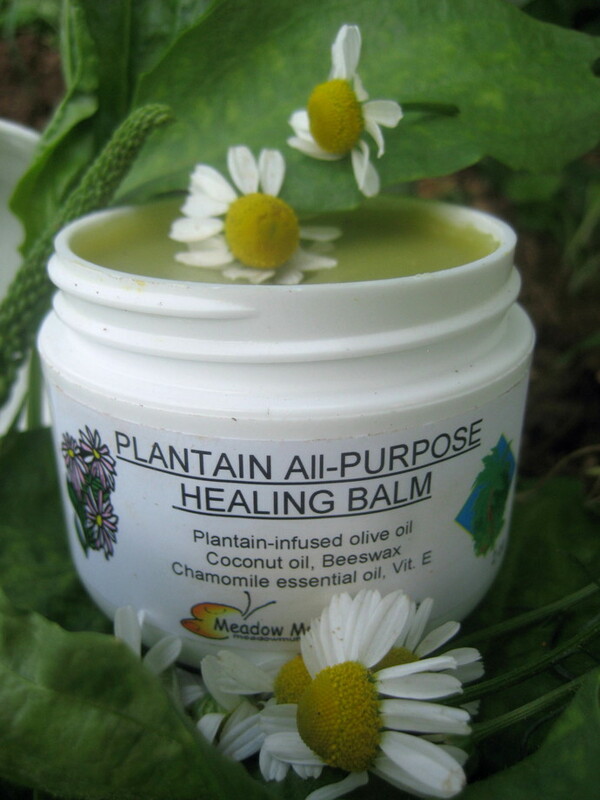 Plantain is both edible and a first-choice remedy for many skin ailments. All parts of the plant, including the seeds, are usable. The herb plantain is not related to the cooking banana, often known as a Mexican or Spanish banana. Infused in cold-pressed extra virgin olive oil to draw out its astringent and antimicrobial qualities, plantain is combined with the wonders of chamomile. Chamomile is so very gentle and as an anti-inflammatory, is used extensively in the care of inflamed skin conditions. Being rich in antioxidants, olive oil alone is very healing to the skin. Add healing herbs and we have a very medicinal oil. Unrefined Coconut oil acts as an emulsifier and helps stiffen the cream, but it's known in skin care for its cooling effects for inflamed skin conditions or minor burns. Coconut oil is very popular for its ability to help skin retain moisture, therefore it is popular as a hydrator for chronic dry skin and itchy, allergy prone skin conditions with pets. Hot spots can develop very quickly with the constant biting and licking and unless the obsessive aggravation to the skin can be curbed, the tender, inflamed area can start to ooze. Coconut oil contains properties that help reduce inflammation and aid in tissue repair. This comes from the type of fats it is made of. More than 90% is a good type of saturated fat called medium chin triglycerides. These good fats are made up of Lauric Acid, Capric Acid, Caprylic Acid, Myristic Acid and Palmitic. These have antibacterial, antiviral and anti-fungal properties, therefore good for the health of the skin and coat. Cat livers don't have the enzymes necessary to break down chemicals in many essential oils. Being cats are fastidious in their grooming you have to be careful to use only those safe for cats. Roman chamomile is on the safe list if properly diluted in a carrier oil. The dilution rate in the pet salves are low but if you'd rather it be left out just let me know.